Note: In the Caribbeans In Europe (CIE) series, I shall be focusing on players who ply their trade in Europe and reporting back on how they’re getting on. St Vincent & the Grenadines may not be known as a footballing hotspot, even within the Caribbean Football Union, but the country’s former star player Rodney Jack has played a major role in boosting the island’s reputation by endearing himself to fans of several English lower-league clubs. Born in Kingstown in St Vincent in 1972, Jack began his career playing for local teams Hairoun Lions and Lambada FC in the early 1990s. It was soon after joining Lambada, in fact, that Jack would get his chance to play in Europe – the team’s manager, exiled Torquay fan Keith Millard, brought his Lambada side over to play a friendly against Torquay in August 1995. Jack’s searing pace and assured finishing quickly impressed United chairman Mike Bateson, who pulled out all the stops to sign the young forward. Understandably, given Torquay’s lowly league standing and the physicality of fourth division English football, Jack took time to settle, but the Gulls were soon rewarded for their patience. Rodney finished the following season as the club’s top scorer, with his direct style and impressive speed proving a handful for flat-footed opposition defenders more suited to coping with aerial and physical threats. However, Jack saved his best performances in a yellow shirt for Torquay’s 1997-98 play-off semi-final tie against Scarborough. Leading 3-1 from the first leg, in which Jack had netted once, United needed their Caribbean corker to provide an outlet in the home leg at Plainmoor as Scarborough piled on the pressure. The striker duly scored twice in the space of seven minutes after outpacing the entire Scarborough defence to seal the tie and send Torquay to Wembley. Unfortunately, Jack was unable to inspire a famous win as the Gulls went down 1-0 to Colchester, although the Vincentian did have a goal ruled out for offside. It would prove to be Jack’s final appearance for Torquay as he joined then-first division side Crewe Alexandra for £650,000 – a record fee for both clubs. Jack’s fine service in his three years at Plainmoor have not been forgotten: in 2009, the player was named as Torquay’s 48th-best player of all time in the club’s “50 Golden Greats” list. Although he stayed at Crewe for five years, the longest spell of his career with one club, Jack was unable to match his scoring form at Torquay – he netted 33 goals in 163 league games for his new club, compared to 27 strikes in 93 appearances for the Yellows. Nonetheless, Jack still managed to contribute some vital, and often spectacular goals. 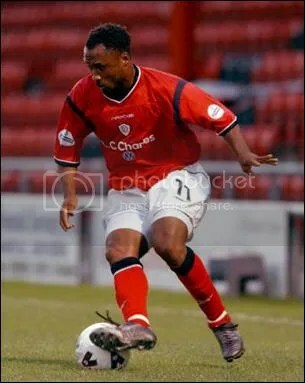 He left Gresty Road in 2003 for Rushden & Diamonds, and despite Jack’s 12 goals in 45 games in his only season at the club, Rushden were relegated from League One following manager Brian Talbot’s defection to Oldham Athletic. Escaping Rushden’s financial troubles, Jack followed Talbot to Boundary Park, but his one-season stay in Lancashire was blighted by injuries – he played just ten games all season. Another brief spell followed, this time at Irish outfit Waterford United, before Jack received a hero’s welcome on his return to Crewe in 2006. However, the club’s reluctance to award Jack with any more than a one-year deal showed that he was no longer the same player – 1 goal in 30 games in 2006-07 represented a shadow of the his previous goalscoring form. Recent years have seen the Vincentian take in a five-game spell at Southport in 2008, before Jack finally resettled at non-league side Nantwich Town. His advancing years, combined with a slight loss of pace, mean that Jack is no longer a regular goalscorer or major handful for defences, but his ability is clear to see – in 2010-11, at the age of 39, Jack was named Nantwich’s Player of the Year. His experience and performances provoked manager Jimmy Quinn to claim “He can be important for us [as an impact player], but I also think he could do a job on the coaching side”. Regardless of whether the 45-cap international chooses to accept Quinn’s offer, Rodney Jack has permanently etched his name into both Caribbean and English football folklore. He is an inspiration to young footballers in a country that rarely boasts European-based players, and his success on the continent is yet to be replicated by any of his compatriots. Thank you for reading! The CIE series can be accessed here. You can check out Dan’s website at www.drawley.wordpress.com. Feel free to leave any constructive feedback in the comments box below. You can get in touch with me on Twitter, Facebook and Instagram.